You’ve booked your Disney Cruise and are looking forward to your vacation. Now, how are you going to get to the port? There are 4 main methods of transportation for passengers headed to their cruise. If you will have your own car with you, then you’ll need to park near or at the port. One option is to arrive a day early and park at your hotel for the duration of the cruise. Most of the hotels in the area will provide shuttles to the port. Even factoring in the cost of the hotel stay, you may be able to save money this way, as opposed to parking at the port. I recommend flying in a day early anyway, because then you’re not worried about making it to the ship on time. Rushing to board is no way to start a relaxing vacation. Parking at Port Canaveral runs between $60 for a 3-night cruise and $120 for a 7-night cruise. You will need to pay when you enter the lot, or, you can make a reservation and pre-pay on the Port Canaveral website. Preferred parking is also available for an extra $20 and will allow you to be closer to the ship; this section is first come, first served. There are also off-site parking lots available, which offer shuttles back to the port. One thing to consider with any option that requires a shuttle is the additional cost of tips, plus the additional time that will add to your embarkation/debarkation process. Since you will have your own car, you may not be on as tight of a schedule as if you were flying, so that option may work out well for you. Benefit – Once you get to your car after the cruise, you are on your own schedule and don’t need to rely on anyone else. Downside – You’re responsible for navigating your way around port and getting your luggage into/out of the car. The second option for getting to Port Canaveral would be to rent a car. You might want to make some stops between the airport and port, or maybe you’ve had a rental car during the Disney World portion of your vacation. No matter the reason, a rental car can be a great option. If you will be keeping the car to use again at the end of your cruise, you can look into the various parking options mentioned above. Or, you can return the car to one of the rental car agencies near port and take a shuttle back to the terminal. If you need a car after your cruise, the car rental agencies have shuttles near customs that you can take to their office to rent your car. Benefit – This is often a cheaper option, as the rental price is per car, not per person like the DCL transfers. Downside – Port arrival and departure may not be as convenient as other transportation options. Child car seats, if needed, are an added cost. While this seems like more of a luxury, if you have a bigger group it can actually be a really economical option. We use FL Tours, who are sponsors on the DIS, and find them to be very reliable and convenient. In addition to limos (seat 6-8) and town cars (seat 4), vans (seat 10) are also available. We enjoy the option of a van when traveling with more than one family. It allows us to have plenty of room, plus the cost isn’t nearly so bad when split up between everyone. One thing to remember when choosing your type of vehicle is the amount of luggage you will be bringing. On our last cruise, we had thought it would be really neat to take a limo to port. We have 3 kids, so ended up having too much luggage to fit in a limo and ultimately, chose a van. One other great thing about a town car company is that car seats are often free of charge. With a rental car, you can pay up to $50 per car seat, so this can be a great savings for a family with multiple children. The convenience of a town car service can’t be beat. The car will pick you up right at the door of your hotel, cruise ship or the airport. The driver will help you with your luggage and with some companies, you may even be able to schedule a 30-minute grocery stop for supplies. Benefit – You can schedule a pickup time that is convenient for you and you don’t have to wait for a shuttle to fill before you can leave. Downside – Has the potential to be expensive if you don't have a large group. 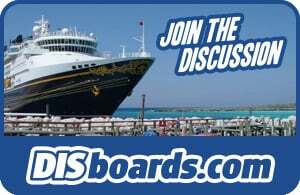 Disney Cruise Line does offer the option of a transfer. You will be picked up at your hotel or at the airport in a coach bus and taken right to port. If checking luggage, you can put a DCL transfer tag on at your home airport and your luggage will be checked all the way through to your stateroom. The problem with purchasing transfers through DCL is the price. For a round trip, airport to Port Canaveral, the price is $70 per person. If you have a family of five like we do, the price is $350, which is the same price as 10 people renting a van from FL Tours. Benefit - By having everything arranged through DCL, there are no worries about being late for the cruise. Downside – Transfer costs are per person, so if you have a larger family, this will be a big expense.